G.C.E A/L 2018 result released now (midnight) – Examinations Dept. The Commissioner General of Examinations stated to media that the GCE A/L examination result will be released today midnight (29th December 2018). However, Minister Akila Viraj Kariyawasam said the release date of examination results had been fixed for December 27 while the GCE O/L exam results have been fixed for March 28 and Grade Five Scholarship exam results for October 5. Posted on December 28, 2018 December 29, 2018 Categories Education, G.C.E (A/L) EducationTags 2013 advanced level results, a level, al result, bank exams, department of education sri lanka, department of examination, doenet lk, doenets.lk, doner, donets education sri lanka, donets lk, education department in sri lanka, education department of sri lanka, education department sri lanka, exam department of sri lanka, exam papers, exam results, exam time table, examination department, examination timetable, gce a level 2014, gce al, gce al chemistry new syllabus, gce al maths, gce al physics past papers, gce al results 2013, gce examination time table, gce o level, gce o level 2014 results, gce o level results, gce o level results 2014, gce ol exam results, gce ol results, math, ministry of Education Sri Lanka, ol exam result 2014, online exam, sl education department, sri lanka education department, sri lanka examination department, timetable, www donets lk, www education department lk, www exams lk, www.doenets.lkLeave a comment on G.C.E A/L 2018 result released now (midnight) – Examinations Dept. G.C.E. O/ L 2017 Examination result release in a short while in Department of Examination official Website of www.doenets.lk. All the very best for all the students who successfully pass all subjects and all the very best for your G.C.E (A/L) Examinations!!! 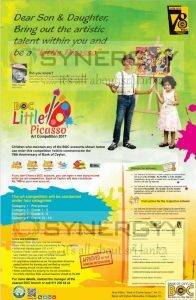 Dear Son & Daughter, Bring out the artistic talent within you and be a “Little Picasso”, Children who maintain any of the BOC accounts shown below can enter this competition held to commemorate the 78th Anniversary of Bank of Ceylon. If you don’t have a BOC account, you can open a new account and enter the art competition. Bank of Ceylon will also contribute Rs.100 to your new account. 1st. 2nd and 3rd winners in each category at national level will receive Rs.100,000/. Rs.75,000/- and Rs.50,000/-respectively, along with a medal and a certificate. 10 merit winners will also be selected. 1st. 2nd and 3rd winners in each category at provincial level will receive Rs.25.000/- Rs.15.000/- and Rs.10.000/- # respectively, along with a certificate. 10 merit winners will also selected. 1st. 2nd and 3rd winners in each category at notional level will receive valuable cash prices The schools that maintain BOC Savings Units will receive special cash prizes. The Examination Department Released that G.C.E. Advanced Level examination re-correction results for G.C.E (A/L) 2016. Fifty-eight thousand candidates have applied for re-corrections this year. The University Grants Commission said that University entrance marks for the 2016 and 2017 batch will be announced by the end of May. Furthermore the Grants Commission said that selection of applicants to University entrance is underway. Department of Examination released G.C.E (A/L) 2016 result now on their Department of Examination Website www.doenets.lk.